Our “big” display for December features the gift of books. 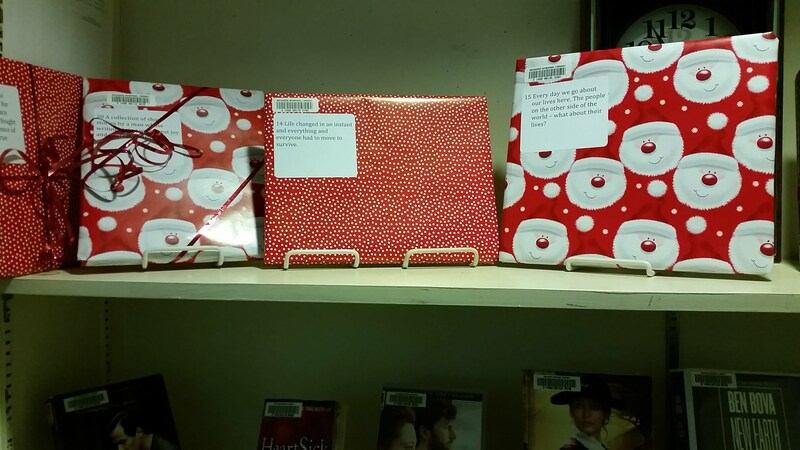 We’ve wrapped both children’s and young adult books and labeled them with a descriptive teaser. The books can be read by adults, by children or read aloud to the whole family. As adults we often forget that books that are shelved in the children’s room are good books and can be appreciated whatever your age is. Several of the library book discussion participants have recommended Kate DiCamillo books as their favorite for our Book Potluck. Over Thanksgiving dinner this year we got talking about books and my sister was trying to remember a book she had liked reading to her kids. After going through suggestions and her describing more about the book — a toy rabbit gets passed from person to person — we realized it was The Miraculous Journey of Edward Tulane by Kate DiCamillo. This was the very book that had been recommended to me! Other DiCamillo books include Because of Winn Dixie, Tale of Despereaux and Flora and Ulysses. Here’s DiCamillo’s take on reading: Reading should not be presented to children as a chore, a duty. It should be offered as a gift. ‹ PreviousWhich Children’s Books Stand the Test of Time?